Although water has the simple formula H 2 O, it is a complex chemical solution. "Pure" water essentially is nonexistent in the natural environment. Natural water, whether in the atmosphere, on the ground surface, or under the ground, always contains dissolved minerals and gases as a result of its interaction with the atmosphere, minerals in rocks, organic matter, and living organisms. The acidity of water is gauged by its pH , which is a measure of the concentration of the hydrogen ion (H + ) in the solution according to the relationship pH = −log(H + ). The higher the concentration of H + in the water, the lower its pH, and the greater its acidity. Acid waters have a pH less than 7 (neutral pH is 7), with the most acid waters at pH 1 or less. Basic (alkaline) waters have a pH greater than 7, with the most basic waters at pH 14. Natural rainwater is slightly acidic because it interacts with carbon dioxide (CO 2 ) in the atmosphere, forming carbonic acid (H 2 CO 3 ). Some of the carbonic acid in the rainwater then breaks down (dissociates), producing more hydrogen ion and bicarbonate ion, both of which are dissolved in the rainwater. The hydrogen ion produced by the second reaction lowers the pH of rain-water. How far it lowers it from the neutral value of 7 depends on how much carbonic acid is in the water as a result of the first reaction, although a limit exists as defined by the equilibrium constant of the reaction. The concentration of carbonic acid, then, depends on how much carbon dioxide is in the atmosphere. In other words, when more CO 2 is present, more acid is produced, and the water becomes more acidic. The Earth's atmosphere presently contains, on average, approximately 0.3 percent carbon dioxide. Using this value in the two reactions above, hydrologists can calculate that the concentration of H + in rainwater at chemical equilibrium is 10 −5.7 moles per liter. This concentration is equivalent to a pH of 5.7, a calculated figure that is close to many actual measurements of rainwater. Because pH 7 is neutral, pH 5.7 is considered slightly acidic. Although natural rain is slightly acidic owing to the natural reaction between rainwater and atmospheric carbon dioxide, the term "acid rain" usually is applied to rainwater that has been made unnaturally acidic by human-caused emissions of nitrogen and sulfur oxides. Slightly acidic rainwater reacts with land-derived dust particles in the atmosphere. These reactions result in the rainwater gaining dissolved calcium (Ca 2+ ), magnesium (Mg 2+ ), sodium (Na + ), potassium (K + ), and other elements. Although carbonic acid is a weak acid, it is very effective over geologic time. Carbonic acid is largely responsible for the breakdown of rocks to soil during chemical weathering and the formation of limestone caverns and sinkholes . The lower the pH, the more acidic the water, and the more minerals it can dissolve. Sea spray, carried aloft by winds blowing across the ocean, contributes to dissolved constituents in rainwater. Although dissolved minerals from spray are more abundant in coastal areas, they occur through out the atmosphere. Sea spray is the primary source of chloride (Cl − ) in rainwater and a significant amount of sodium (Na + ). Example compositions of precipitation are given in the table (analyses 1 and 2). All concentrations in milligrams/liter. TDS is total dissolved solids and pH is a measure of the acidity of the water. A pH less than 7 is acidic. A dash (-) indicates that the component was not detected or the water was not analyzed for this constituent. A tilde (~) means "approximately." Oxidizing–reducing reactions change the charge of an ion as it gains or loses an electron. The solubility of some elements in water depends on whether they are oxidized or reduced. The natural environment may control in which state the element occurs. In the natural environment, iron (Fe) can exist either as reduced iron (Fe 2+ ) or oxidized iron (Fe 3+ ). Iron is more soluble in the reduced state than it is in the oxidized state, where it often occurs as an iron oxide mineral (Fe 2 O 3 ). Therefore, if the local environment produces the reduced iron form, the water will have higher concentrations of dissolved iron. The most common causes of a reducing environment are oxidation reactions involving organic matter. The oxidation of an organic molecule can result in iron, existing as a solid iron oxide mineral (Fe 2 O 3 ), being dissolved into the water as reduced iron (Fe 2+ ). Other elements that behave similarly include manganese (Mn), sulfur (S) and nitrogen (N). The composition of stream and lake water varies from one place to another, and within a single watershed varies both seasonally and along the stream's path. The major source of dissolved minerals in streams and lakes is the rocks the water moves over and through along its path from where it falls as precipitation to where it exits the watershed or enters the lake. As the slightly acidic water encounters rocks, the minerals begin to dissolve and contribute their elements to the water. The type of rocks in the watershed influence stream-water composition. A stream flowing over sedimentary rocks will have a different composition than a stream flowing over igneous rocks (see table, analyses 3 and 4). Also contributing to stream-water and lake-water composition are reactions between the water and the biomass , particularly in forests. Leaves and branches help neutralize the pH of the precipitation and contribute dissolved elements. Biologic activity in the stream or lake (e.g., photosynthesis) can change pH and dissolved oxygen content. Temperature influences the amount of dissolved gases (e.g., oxygen). Stream-water composition changes from headwaters to outlet because the water is in contact with the rocks and sediments of the streambed for cumulatively longer times. Also, tributaries draining different geologic areas may enter the stream, and groundwater may seep into the stream. In pools or other slow-moving stream segments, oxidizing and reducing reactions may occur where organic matter accumulates. Seasonal variations in stream-water composition may reflect differing precipitation amounts, as well as the portion of the stream's flow that is contributed by groundwater. In the drier times of the year the proportion of groundwater contribution is greater than in the wet season (see table, analyses 5 and 6). Lake-water composition is influenced by evaporation, among many other factors. As water evaporates, the dissolved minerals are left behind. The more evaporation, the higher the concentration of dissolved minerals (salts) in the water. If evaporation continues far enough, minerals such as calcite (CaCO 3 ) or gypsum (CaSO 4 · 2H 2 O) may precipitate from the solution. The Great Salt Lake in Utah (see table, analysis 7) began as a freshwater lake (Lake Bonneville) during the last Ice Age. Progressive evaporation as the climate became arid has made it saltier than the ocean (see table, analysis 8). Many of the factors that influence the surface water composition also influence groundwater composition. Groundwater is always in contact with rocks and minerals and moves more slowly than surface water—centimeters per day instead of kilometers per hour. As a result, groundwater often contains more dissolved minerals than surface water (as is evident from comparing streams and groundwater in the table). When water seeps below the surface, it passes through the soil where microbial respiration processes release CO 2 . As water encounters the CO 2 , the pH is lowered, and the water can dissolve more minerals. At higher temperatures, minerals dissolve more readily. Deep groundwater tends to be warmer (e.g., the source of water from hot springs) and, as a result, has higher mineral content. Ultimately, what controls the composition of groundwater is (1) the geologic materials groundwater is moving through, (2) the type of reactions taking place, and (3) the contact time, or length of time groundwater has been in contact with the rocks. The contact time may vary from a few days to more than 10,000 years. The table shows analyses of groundwater from different geologic formations (analyses 9 and 10), and differing contact times (analyses 11 and 12). Knowledge of water–rock–organism reactions helps hydrologists unravel the origin of a specific water parcel. Carefully analyzing the water allows them to identify what types of reactions have affected the water, and to understand the geological and ecological history of the area. 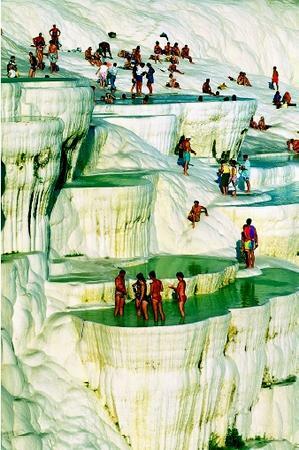 Sunbathers at Pamukkale, Turkey stand in pools atop travertine limestone terraces formed by the progressive deposition of minerals from spring waters. Highly mineralized hot water (36°C) issues from elevated springs, and flows downslope for about 100 meters. As the water cools, calcite (calcium carbonate) precipitates, forming terraces in a stair-step fashion. The natural hot springs derive from the volcanic features found in the Aegean region, and have been used since Roman times. areas, however, groundwater with a TDS of greater than 100,000 mg/L is found. (Sea water has a TDS content of approximately 35,000 mg/L.) Saline groundwater has been found in a variety of geologic environments, commonly in marine sedimentary rocks, but also in ancient metamorphic and igneous rocks. Saline groundwater can form in at least three ways: (1) from trapped sea water; (2) from dissolving highly soluble minerals; and (3) as a result of a long contact time with rocks, and thus chemical reaction time with surrounding rocks. Trapped Sea Water (connate water). When marine sediments are deposited, some sea water commonly remains trapped between the mineral grains. Connate water later may migrate through the rocks as groundwater. Highly Soluble Minerals. Groundwater encountering easily dissolved minerals such as gypsum (CaSO 4 · 2H 2 O) or halite (NaCl), will become saltier. Contact Time. Groundwater that follows deep paths below the ground may be in contact and able to react with rocks for thousands or tens of thousands of years. This groundwater will acquire a higher TDS with time. SEE ALSO Acid Rain ; Cavern Development ; Chemical Analysis of Water ; Fresh Water, Physics and Chemistry of ; Groundwater ; Hem, John D .; HO T Springs and Geysers ; Hydrologic Cycle ; Karst Hydrology ; Mineral Waters and Spas ; Weathering of Rocks . Drever, James I. The Geochemistry of Natural Waters: Surface and Groundwater Environments , 3rd ed. Englewood Cliffs, NJ: Prentice Hall, 1997. Hem, John D. Study and Interpretation of the Chemical Characteristics of Natural Water, 3rd ed. Alexandria, VA: Department of the Interior, U.S. Geological Survey, Water-Supply Paper 2254 (1985). HOW CAN WE REMOVE SODIUM FROM NATURAL WATER.